Our training philosophy was born of the mountains, of high standards and hard work. No matter the athlete, our craft applies: wield the “tools” of a unique training environment to create a better, faster, stronger, more conscious human being. Our goals are to train the mind of the individual along side the body, for the mind compels the body to endure and to achieve. To injury proof the body all the while encouraging the athlete to excel. We have created an environment of support, where honesty, character and integrity are paramount; and where motivation, instruction, and guidance are given to those with the desire to change. These practices do not apply to just the “elite” of the athletic world. They apply to each and every one of us. We are all athletes! We all desire health, strength, happiness, and the capacity to excel in whatever we choose to do, at any level. Ripple Effect Training Center is a private facility. To effect positive change in a single individual or a small group; focused work must be done. All training is individualized to meet the needs of the athlete. Whether or not it is a general recreational athlete who just wants to enjoy his days off, a high end athlete who’s performance during a season or for a specific event is imperative to her, or the individual who just desires change and is seeking an environment of knowledgeable instructors and support. Knowledge can only be gained only from experience, at Ripple Effect our instructors bring a life time of experience not only from the mountain environment but that of this unique gym environment. Our ethos is to enhance performance and to grow a community. Our Athletes are a reflection of our dedication. The focus of my work and my life is to engage others in activities that create positive self change, to inspire, mentor, motivate, encourage, educate, and if that means changing the world one person at a time, so be it. I derive the deepest satisfaction from seeing others succeed, however I will be the first to tell you it is not just about being faster or stronger – it is about being a more conscious human being. Carolyn is a life-long climber and mountain guide who has made the successful transition into full time coaching work. 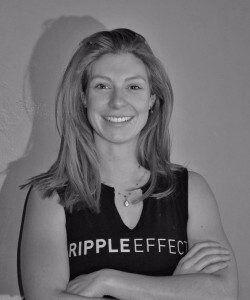 Carolyn is founder and lead instructor at the Ripple Effect Gym in Carbondale, Colorado. Carolyn’s personal pursuit of progress with her climbing led her to training. Training led her to Mark Twight and Gym Jones. 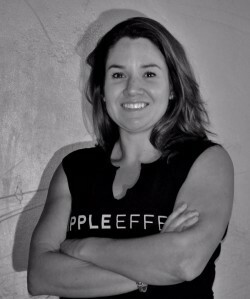 In 2010 she earned her Gym Jones Certified Instructor credential. Carolyn can lead 5.12 rock, M8 mixed, and ski 50 degree couloirs. She has ski guided Mont Blanc, the famous Chamonix-Zermatt Haute Route and the Italian Ortler Traverse multiple times. In 2001 she attempted to climb Makalu by a new route on the South Face with a small 4-person team. Most recently she has been competitive in mountain runs such as the Imogene Pass run, R2R2R Grand Canyon, Sandia Crossing, Four Pass Loop Elk Mountains, Power of Four Skimo Race. Ski 45/50 degree slopes; has guided multiple Haute Routes in The Alps, Argentiere to Zermatt, and the Ortler region of the Italian Alps. Comfortable on Grade V alpine routes: has guided ascents 40+ summits in Bolivia, Ecuador, the French and Swiss Alps, WA, Canada. Competitive finishes in Imogene Pass Run and Sandia Crossing, numerous times. 2018: Expanded and moved the Ripple Effect to new location in Carbondale. 2016: Power of Four SkiMo Race, 25 miles, 10,000 vertical gain. 8 hours. 2015: Four Pass Loop, run in a day, 27 miles, 10,000 felt of elevation gain 8.5 hours. 2009: FFA/Red Pointed “Autumn Ivy”, Sandia Wilderness, 5.12 Trad; and Sport 5.12a & 12b. Heliski in Terrace BC; Guided a 12-day Ski Mountaineering trip in the Ortler Region of Italy; 100,000 vertical (up & down) mostly self-propelled. 2007: Guided the Haute Route (ski mountaineering tour through the Alps, from Chamonix, France to Zermatt, Switzerland following the Verbier variation), 60 miles, 20,000′ of elevation gain. 2005: Mount Taylor Winter Quadrathlon (Ride, Run, Ski, Snowshoe – 43 miles, 4800 ft elevation gain), 1st place (35-39), 7th female overall in 5:19:35; Established NM based guide service and created her women’s rock and ice climbing series “Climb Like A Girl”. 2002: Founded RIPPLEFFECT Training, FFA- Dancing on the Moon 5.11, 2xBW DL 255# at the time. 2001: Expedition to Makalu: Climber and Trip Sponsorship Coordinator for the American Makalu Expediaton; the 5th highest mountain in the world. 1997: Climbed a Grade V in a day, “Epinephrine”, Red Rocks, in 5 hours. Guided 20+ 5-6,000M Peaks South America, Ecuador and Bolivia. 1993-1994: Began Climbing guiding career, education with AMGA, first training certification, Imogene Pass Run 93 & 94 – 1st age group 20 – 29,3rd overall. 1994 Sandia Crossing Run 27miles 1st Female. Illiniza Sur (17,600ft) and Norte (17,300ft) in Ecuador. Illimani, West Ridge (21,100ft); in Bolivia. North America: North Ridge Mt. Baker (10,781ft) AI 4 Grade IV, Coleman Deming Route, Easton Glacier Route. Mt. Stuart (9,415ft) Stuart Glacier Couloir”, IV, WI3, 5.6, WA, car-to-car in 16hrs. CMC Route Mount Moran (12,065ft), NW Couloir Middle Teton (13,200ft) AI 4 easy 5th. Pollux AD SW ridge; West Flank of Dom Peak, Switzerland, highest peak (entirely) in Switzerland. Betsy grew up in the Pacific Northwest, with the mountains, rivers and rocky coastlines as her playground. Remote landscapes, harsh conditions, and the company of those who “get it” energize and inspire her. Betsy has been working with Carolyn since 2012. 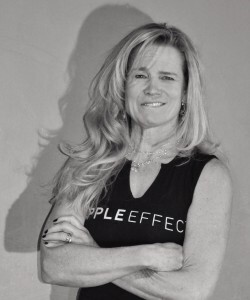 She is dedicated to the continuous learning of new tools and techniques – both inside and outside of the gym – that effect self-growth, injury prevention, and blasting through obstacles. 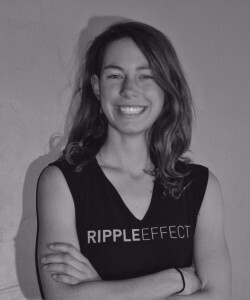 In addition to her work at Ripple Effect Training, Betsy guides for International Mountain Guides in Washington state and South America, and teaches Avalanche Awareness and Education Courses in Colorado. Prior to coaching and guiding, Betsy earned an Environmental Engineering B.S.E. from Thayer School of Engineering at Dartmouth College in Hanover NH, and subsequently worked as a mechanical and manufacturing engineer in Albuquerque, NM. She soon realized that her passion for adventure and a life well lived exceeded her ability to spend 70 hour work weeks inside an office. 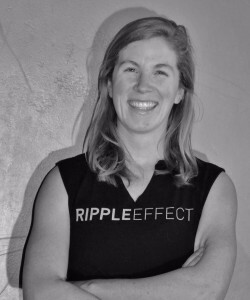 Departing from the engineering world has allowed her to pursue white water raft guiding, rock climbing instruction, alpine ski instruction, ski patrol and emergency medicine, and eventually athlete training and mountain guiding; all endeavors which continue to inspire and inform her work and life outlooks. Lindsay grew up in Carbondale with her now husband, Trenton, with whom she has two energetic and curious little kiddos, Ivy (7) and Wyatt (5). She has enjoyed a variety of activities throughout her life including running, playing soccer, competing in various martial arts, modern dance, and snowboarding, which ultimately lead to riding on the CU Boulder snowboard team for a season. She graduated from CU Boulder with a degree in history. She recently ran the Lead King Loop 16 mile backcountry race in Marble, competed in The Red Bull Rise team event at Ajax Mountain, and the 2017 NYC Marathon (her first marathon!) to raise funds for the Chris Klug Foundation. She is looking forward to running many more and working hard towards beating her time. Her family loves to get outdoors hiking, skiing, boating, riding their bikes, jeeping or just enjoying the awesome Colorado sunshine. She is attracted to bright colors and shiny things, loves to travel, and finds cooking therapeutic. Sarah finds that the best people, moments, music, and laughter find her through movement. Her life can be traced through various mediums of it: team sports, games of barefoot capture the flag, exploring the woods, and climbing up things–trees, mountains, the side of her house–all suffice. These days she does most of her moving through climbing, running, yoga, skiing, and playing with her half-lemur, half-dog, Sophie. Sarah graduated from Skidmore College in Saratoga Springs, NY in 2016 with degrees in History + Environmental Studies. During her years in college she additionally completed two semester courses with NOLS in 2013 and 2015, focused on climbing and outdoor education. Wilderness First Responder, Wilderness First Aid. She is a Leave No Trace Master Educator and she is a Certified Yoga Instructor (RYT) 200-hr. She has competed in the Cape Cod Marathon, Saratoga Palio Half Marathon, and numerous other mountain runs. Her life now finds her focused on climbing and mountain running.